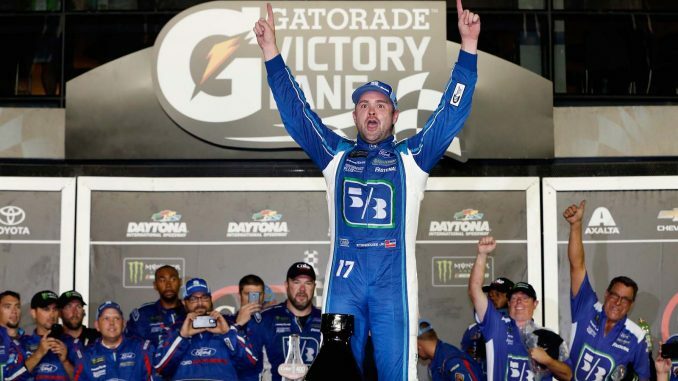 DAYTONA BEACH, Fla. – Ricky Stenhouse Jr. is the accomplished restrictor plate master so far in the Monster Energy NASCAR Cup series this season Seven races after he won his first career Cup race at Talladega, Stenhouse charged to victory in Saturday night’s Coke Zero 400 at Daytona International Speedway. 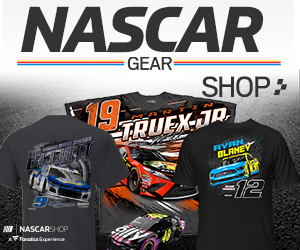 Stenhouse took the lead on the final lap of an overtime finish in NASCAR’s midsummer classic passing David Ragan and holding off Clint Bowyer and Paul Menard for his second career win. In one of NASCAR’s longest races featuring a record number of cautions, 14, the story of the night was survival. Among those swept up in crashes and who finished in the garage; Kevin Harvick, Martin Truex Jr., Ryan Blaney, Denny Hamlin, Joey Logano, and to the disappointment of his legion of fans, pole sitter Dale Earnhardt Jr. who was campaigning in his final Daytona races as a fulltime Cup driver had several issues. He lost a tire and got into the wall on lap 52. He would go two laps down as the crew repaired damage, but made those laps up. He was running seventh late on lap 105 when Harvick lost a tire crashing and sending Earnhardt into the wall and both to the garage. “That first deal we brushed the wall a couple of laps earlier and I thought everything was okay,” Earnhardt said. “I came through the tri-oval and I had a right front going down and it was trying to spin out, so I was trying to lift, but there was really nothing I could do because there were so many guys behind me. We got into (turn) one and hit the wall. But the guys worked on the car; we got our laps back and was about to have some more fun – get back up in there and mix it up. Then, that happened with the No. 4. It was a somewhat anti-climactic finish to a week that saw him win the pole and receive the adulation of the track and the masses as he begins his farewell tour. Brad Keselowski led the most laps. 35, won the first Stage, but had to retire after receiving damage in the Harvick-Earnhardt a crash on lap 105. He was able to continue but a suspension part broke on his Ford on lap 116 and headed to the garage. The race was forced into overtime when Kyle Larson who recovered from damage sustained earlier in the race and was fighting for the lead was turned by Blaney on the front stretch. Larson’s car was sent airborne collecting five other cars and forcing NASCAR to throw a red flag for 8 minutes 41 seconds. The restart came with three laps to go but a final crash between Denny Hamlin, and Erik Jones set up the overtime finish won by Stenhouse. Behind Menard, Michael McDowell scored a career high fourth place finish, with Ryan Newman fifth. Ragan held on for sixth followed by Brenden Gaughan, AJ Allmendinger, Jones and Chris Buescher. The Monster Energy Cup Series heads to Kentucky Speedway for the Quaker State 400 next Saturday night.